October 4th, 1955, Dem Bums, the Brooklyn Dodgers, defeated the New York Yankees 2-0 in the seventh and deciding game of the 1955 World Series. It was the Dodgers first World Series victory. They'd been here seven times before, five against the Yankees (in 1941, 1947, 1949, 1952 and 1953) only to limp back home with the cry "Wait 'til next year!" They pulled off the 1955 title after losing the first two games at Yankee Stadium. In the finale, it was left-hander Johnny Podres who silenced the Yanks on eight hits and a pair of free passes. First sacker Gil Hodges drove in both runs. In the fourth, Roy Campanella smacked a double and Hodges followed with a solid single. In the top of the sixth, Brooklyn loaded the bases, helped by a Yankee error, and Hodges' sacrifice fly plated Pee Wee Reese with the final run. In bottom half of the sixth for the Yankees, Billy Martin walked and Gil McDougald reached on a bunt with nobody out. Yogi Berra connected off Podres and sent a liner down the left-field foul line surely enough to bring in both runners to tie the game. But, in one of the classic moments of the World Series, defensive replacement Sandy Amoros, one of the fastest players in the majors, came flying across the field and with his gloved right hand extended made a sensational one-handed grab and managed to avoid crashing into the fence. He wheeled and threw to shortstop Pee Wee Reese who relayed to Hodges at first for a double play. Hank Bauer then grounded out to end the inning. 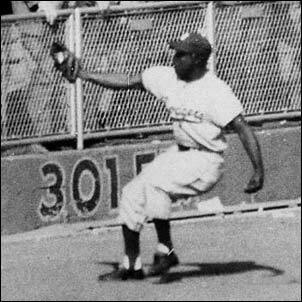 In the last of the ninth, Elston Howard grounded to Reese who tossed to Hodges to end the game and kick off pandemonium in Brooklyn. In an unforgettable front page, the New York Daily News, wrapped up the story with its "Who's A Bum" cover. It would be Brooklyn's first and last World Series triumph. 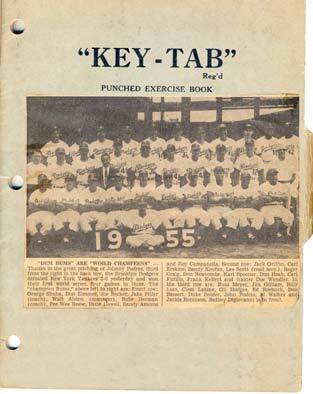 They won the National League pennant again in 1956, but lost to the Yankees. 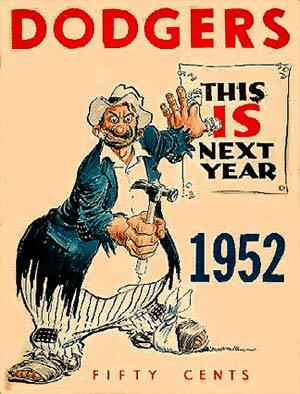 They finished in third place, 11 games back in 1957 and in 1958 the Dodgers began play in Los Angeles. The Dodgers ran out to a 22-2 record to start the National League season. As you can see from the kid's scrapbook, the team began the season with ten straight wins. Four of the first five wins were complete games. Carl Erskine was 3-0 after just 12 games. After Podres lost on April 22nd, and they won and lost against the Giants, they went on an eleven game winning spree. Keeping my scrap book (utilizing a grade school exercise book) was a daily delight. I kept pitching details on every game, batting statistics by the week, final stats, along with a few photos from either The Sporting News, Time, Life or Sport magazines. I'm not sure I ever properly thanked Chris Roewe of TSN. 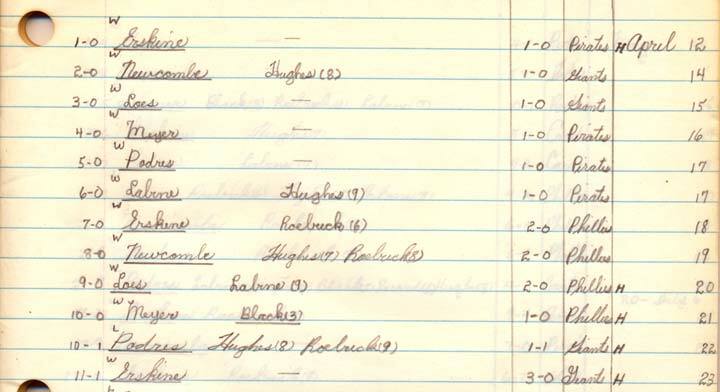 In early August of 1955, this 13-year-old emerging baseball fan and statistician sent a handwritten, five-page note including a game-by-game list of all the Dodger games with pitching lines. I was missing a few details and asked The Sporting News for help. Mr. Roewe kindly filled in the details and returned my list. I was quite impressed. Even more so in retrospect. April 9, 1913 - Ebbets Field opened in Brooklyn and the Phillies defeated the Dodgers 1-0 before 10,000. The stadium, which cost $750,000 to build, was named after Charles Ebbets, the club's principal owner. In 1960, the ball yard was demolished and eventually was replaced by apartment buildings. Among the reasons the Dodgers were so popular across North America (even with youngsters on the baseball news-starved Canadian prairies) was Jackie Robinson. In 1947, in the face of incredible odds and abuse, Robinson became the first black player in the modern history of Major League baseball. 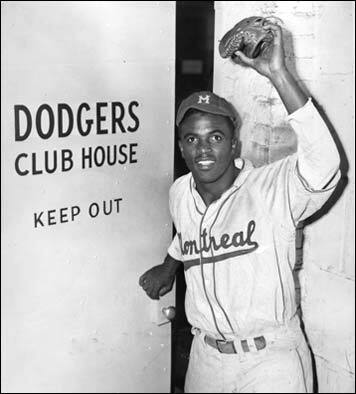 He had broken baseball's colour barrier the year previous in his professional baseball debut with the Dodgers' top farm team, the Montreal Royals. In his first game, in the Royals' season opener, all Robinson achieved was four hits, one a three-run homer, in five trips to the plate. He scored four runs and stole two bases. 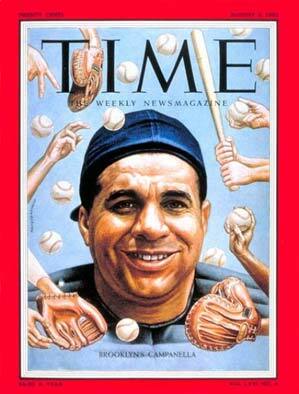 After a career which saw Robinson chosen as the National League's Rookie of the Year in 1947, the Most Valuable Player in 1949, selected for six straight All-Star Games and play in six World Series, he was inducted into the Baseball Hall of Fame in 1962. In 1997, Major League Baseball took the unprecedented step to retire uniform number 42 across all major league teams. In 2004, MLB began a tradition, on April 15th, "Jackie Robinson Day", which sees all players, on all teams wear number 42. 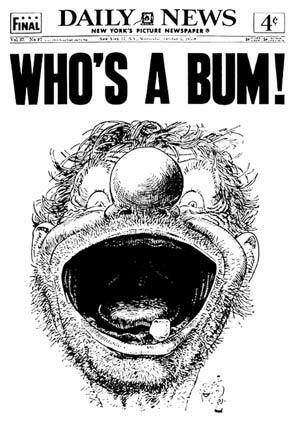 It is somewhat ironic that Leo O'Mealia's "Who's A Bum" front page cartoon so defines the Dodgers 1955 triumph. It was Willard Mullin, the cartoonist for the New York World-Telegram who created the "Brooklyn Bum" as the personification of the team. 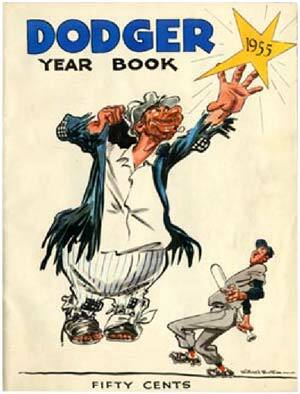 To the left are examples of Mullin's covers for two of the Dodger yearbooks (from America's Team, see the link below). For those of us outside of New York, his work was familiar from drawings in The Sporting News. Vin Scully. Age 87. Dodger broadcaster for 65 consecutive seasons. Legend. He began his career alongside Red Barber in the early 1950s (first doing football) and has agreed to continue in the booth for the Dodgers in 2015. In a not-so-bright idea back in the 1960s, a young Canadian broadcaster thought it a good idea to try and get some baseball broadcasting tips from the Dodger great. (Although erratic, the radio signal from Los Angeles often travelled some 1,500 miles north so those of us even in the wilds of Alberta could pick up the evening Dodger broadcasts.) So, the kid put together a lengthy tape (probably two hours or more) of baseball play-by-play and mailed it off to Mr. Scully asking for his kind assistance. Now in those days this was delicate reel-to-reel tape and a considerable package. Quickly, I realized this was a pretty dumb idea and such an imposition. I wonder to this day, what Vinnie must have thought when he received a request out of nowhere that he take up most of a day of his busy life to listen to the kid and provide some baseball broadcast pointers. 42, The Jackie Robinson story.